Brock Mosley holding up two lunker smallmouth on stage at St. Clair last Sunday. Mosley was relaxed and ready when he got to Lake St. Clair last week and he showed his offshore smallmouth fishing prowess while staying in contention from start to finish. Mosley caught a limit of bass each day and led after the second day of competition with a 5-fish limit of smallmouth’s weighing 25 pounds 5 ounces. The talented young angler garnered another $25,500 for his runner-up finish including $500 for leading the tournament on day two. Mosley decided to spend his time in that area fishing for quality fish instead of quantity and it paid off. 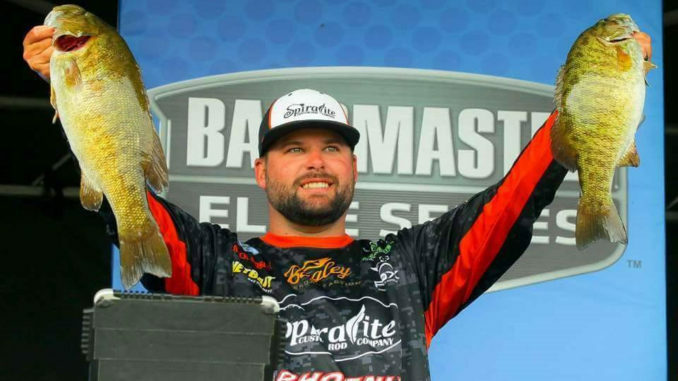 “My main goal last week going into the tournament was to get into the Angler of the Year Championship at Mille Lacs Lake – Onamia, Minnesota in a couple of weeks,” Mosley said. “First place in that tournament is a guaranteed $25,000 and everybody else who qualifies will be paid based upon their year-end Angler of the Year finish.” With the tournament winnings from that event Mosley will hit the $100,000 mark for the year. Mosley started the tournament in fine fashion with a 5-fish limit of bass that weighed 20 pounds 8 ounces anchored by a 5-pound smallmouth caught in the first hour. That limit was good enough for 13th place and gave him the confidence to go back again the next day to the same area. That’s when the young gun made a move reminiscent of some of Rick Clunn’s famous tournament moves. That hefty limit attracted the attention of the country as all eyes were on Mosley and his Leader board first-place finish for the day. “Every move I made paid off,” said Mosley. 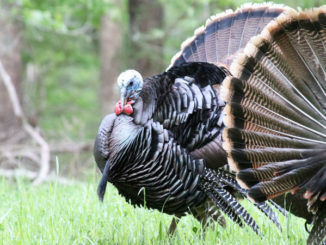 “I just came up a little bit short on the final day with a limit of 4 pounders. I just needed a couple more 5 pounders to bite to win it.” But after 4 days of heavy fishing pressure in the area it just wasn’t meant to be. 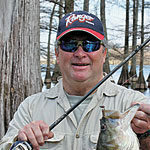 So how did a shallow water fishing expert from Mississippi become an accomplished open water smallmouth expert? Practice and valuable experience gained on the tour along with his natural ability has prepared the young angler well. It didn’t hurt that he’d grown up fishing competitively with his father Danny Mosley against some of the nation’s best bass anglers right here at home. Mosley caught most of his fish on a Spiralite Defiant SDS72MF 7’2″ rod and Ardent Apex Elite spinning reel with 15 pound Seaguar line drop shotting a Net Bait contour worm with a ¼ ounce weight. If the recent tournaments are any indication Mosley will soon be joining the winning ranks on the Elite Series Tour and qualifying for a Classic too!